Although CBS Sports and ESPN have the lock on live Southeastern Conference (SEC) football game coverage. Comcast Sports Southeast (CSS) still has the rights for tape delay broadcasts (for now at least). But some things stayed in the family for the SEC for this year. When CSS play-by-play commentator Matt Stewart has to leave town to call Conference USA games for CSS, veteran and multiple EMMY Award-winner Bob Neal stepped into the booth alongside former University of Georgia quarterback Buck Belue to call the games. The family connection? Bob is the father of Dave Neal, who calls live football action on the SEC Network for the early Saturday afternoon SEC contest each week. This picture was taken in the Georgia Tech auxiliary TV booth as Neal and Belue were getting ready to record their open for the Saturday, November 28, 2009 game between Tech and UGA. 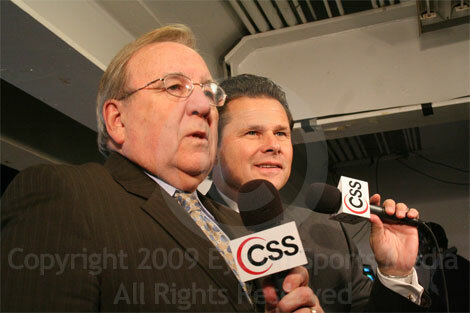 Copyright 2009 by Eye on Sports Media/The Cayuga Group, LLC.